In a few weeks’ time, Samsung Galaxy S9 will be here to take the place of the fan favorite Samsung Galaxy S8. As usual, many will be contemplating on whether to make the switch or stick to the tried and trusted S8, something that can be a very tricky decision to make. While Samsung Galaxy S9 has not yet been released, as usual, leaks and rumors have already given us an idea of what to expect. With this in mind, this article closely compares what we already have in the Galaxy S8 against what’s coming in 2018, but a few things might change along the way. Samsung Galaxy S9 is set to keep a huge chunk of the design language of the Galaxy S8 with only minor tweaks. Apparently, the screen sizes of both the S9 and S9+ will still be at 5.8 and 6.2 inches, but looking at recently leaked images, it’s possible that the upcoming S9 twins will be slightly smaller in size when compared to the S8 pair. This is because the bezels at the top and bottom of the screen will reportedly be significantly smaller, thus paving way for much smaller footprint. There shouldn’t be any other notable design change on the front panel, but the back panel will also undergo some changes. Apparently, the fingerprint scanner will shift from the side of the camera lens to the bottom, which should be a welcome idea considering the backlash the S8 faced with respect to the scanner’s location. The Galaxy S9+ is also expected to get a second lens that will be lined vertically to the fingerprint scanner with the dual-tone LED flash taking its position on the side. We don’t expect any changes in the design materials, which means that glass and metal are still top contenders. Also, you can expect both phones to come with IP68 certification alongside Corning’s Gorilla Glass (5) protection. Other design aspects such as a dedicated Bixby button, volume and power buttons, USB-C port and 3.5mm audio jack should also keep their place as with the case of the Galaxy S8. As for the surprise changes, the fingerprint scanner could find a new home under the display screen, something that was expected long ago. 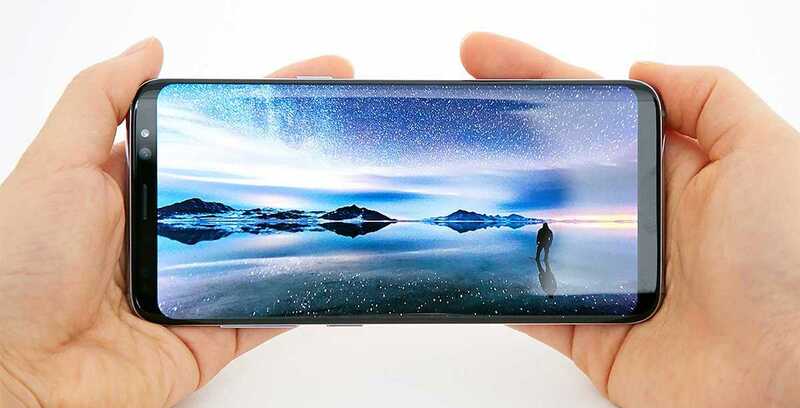 Synaptics has started mass producing an in-display fingerprint scanner that will be used on bezel-less OLED Infinity Display screens starting next year – and what other company uses bezel-less OLED Infinity Display screens if not Samsung? Only time will tell. Despite the minor changes on the outside, the Galaxy S9 will have significant upgrades on the inside, but each year, this is what fans usually expect. There’s a new processor, a Qualcomm Snapdragon 845 for the U.S. and Exynos 9810 for international markets, up from Snapdragon 835 and Exynos 8895 used on the S8 and S8+. While the Galaxy S9 will stick to the same 4GB RAM, the Galaxy S9+ will reportedly get a bigger 6GB RAM module. There won’t be any changes to the storage capacity, where the base models will house 64GB units with room to expand via a microSD card. However, don’t be surprised if things turn out a little bit different now that Samsung is already manufacturing huge 512GB storage units for mobile phones. If anything, a Samsung Galaxy S9 or S9+ with a massive 512GB of onboard storage might not need a microSD card slot. Software-wise, the only major change will be the jump from Android Nougat to Android Oreo out of the box. With the debut of Samsung Galaxy S8, the company also ditched the famous TouchWiz skin in favor of a new Samsung Experience. This is the same skin we expect to see on top of Oreo with respect to the S9 pair, although it should be a newer version. Samsung is also thought to be working on new software to improve the iris scanning technology of the Galaxy S9 and S9+ as well as up the game as far as Bixby digital assistant is concerned. As pointed out earlier, Samsung Galaxy S9 will stick to a single-lens camera, but the Galaxy S9+ will get a dual-lens setup. This was expected, especially since Samsung has always used the Note series to introduce new features. The Galaxy Note 8 got a dual-lens setup, which made it a no-brainer that the S9 or S9+ for that matter will also get the same treat. The dual-lens setup on the Galaxy Note 8 has a 12MP+12MP combination, which is likely to be the same combination that will be used on the Galaxy S9+. As for the front shooter, we don’t expect anything different than the 8MP sensor used on the Galaxy S8 and S8+. Given the high chances of having a reduced footprint, both Samsung Galaxy S9 and S9+ are unlikely to get bigger batteries than the current units. Perhaps things could change slightly for the standard S9, but at 3500mAh, the Galaxy S8+ has one the biggest batteries on the market – and it won’t do any harm retaining the same capacity on the S9+. A recent report has suggested that the iris camera lens’ resolution will be upped from 2MP to 3MP, making it better when it comes to capturing clearer images. With the continued focus on VR, you can also expect some more additions targeting better VR experiences for users, most of which will be courtesy of the AI-based Snapdragon 845 processor. Note that a lot of what is out with respect to Samsung Galaxy S9 and S9+ is based on rumors, leaks and speculations. As a result, not everything in this article might materialize, but we expect a huge chunk of it to make to the two S9 phones. If you have anything else you’d wish to see on the Galaxy S9 or S9+, feel free to chip in via the comments section below. Meanwhile, take this piece with a grain of salt.